Do you love subverting the status quo in gaming? Do you skip every tutorial, only to look it up later? Do you love immersive worlds and plots, but hate linear game mechanics? Well then, you must be a fan of open-world games. Open-world is a type of game where the player can roam freely, usually to complete sidequests that are adjacent to the main story. In some of these games, the main story is optional, meaning that every player’s experience is different, and players usually have to replay the game several times before unlocking every secret. 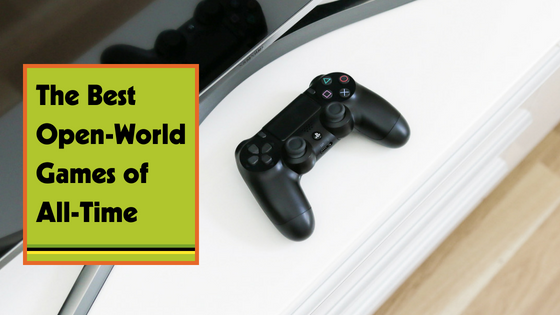 These games are well regarded as some of the best open-world games and, while this list is not all-encompassing, it does include many fan favorites. If you’re familiar with console gaming at all, you knew this was coming. Fallout 4 is a blockbuster success and a fan favorite, with highly customizable gameplay and enough side quests to keep even the most thorough players happy. You are dropped into a post-apocalyptic version of Earth, and it is your job to find your missing son, surviving the harsh world around you with your loyal attack dog, Dogmeat. Vault Boy is an instructor with the best intentions, and the balance of humor and fighting weaved throughout the game makes for a thrilling experience. Another highly successful fan-favorite is Rockstar Games’ GTA V, an open world concept unlike any other. The player explores the fictional city of Los Santos, San Andreas, free to do whatever he or she pleases. There is a running system of heist-centered gameplay that makes up most of the essential storyline, but the real fun is in the side quests and NPCs (non-playable characters). Every single NPC (and there are a lot of them) has their own unique set of dialogue that is so in-depth that in each gameplay the player can potentially hear a different part of a dialogue that they haven’t before, just by being in the right place at the right time. This mountainous amount of dialogue, coupled with the true open-world dynamics of this game (along with all the raunchy fun it involves) makes this game one with very high replay value. The Legend of Zelda is one of those game franchises that have taken over the world in popularity. Any Nintendo veteran remembers staying up late after school to binge on fruit loops and play Majora’s Mask on GameCube, and now with Breath of the Wild becoming a bonafide success on the Nintendo Switch, the franchise is doing anything but slowing down. This new installment features an open world where almost everything is climbable. See that gigantic mountain over on the horizon? Yep. Climbable. A boulder in the middle of the road? You betcha. A gigantic tower that doesn’t really fit in with the rest of the scenery so it must be part of the story? Heck yeah. Players have spent a lot of time figuring out the extent of this game’s possibilities, including how to make flying machines that are supposed to make travel easier, but usually end up being a clunky mess. But by messing with character abilities, like Link’s rune power, players can do some pretty amazing things, like making trees fly. Another huge gaming success is Elder Scrolls: Skyrim, where players are immersed in the world of Tamriel, a medieval-inspired continent with more dragons, magic, and spider-filled caves (unfortunately) than they can handle. The incredible success of this game is due in part to the complex and lore-filled storyline, and the ample amount of side-quests, ranging from silly to life-threatening. Fans of this game are not regular fans, they have a unique obsession with the game’s lore and world, making this 2011 game still at the top of most gamers’ lists. A favorite of Markiplier and other YouTubers, Subnautica has stolen fan’s hearts and proved how truly terrifying the ocean can be. Stranded in an alien ocean, the player must fight to survive and collect different artifacts to rebuild their broken spaceship. With a seemingly endless ocean to discover and bone-chilling aquatic creatures like the Reaper Leviathan, a colossal foe as horrifying as its name, it’s no wonder that this game is a favorite of thrill-seekers and horror-fanatics alike. If one of these games tickled your fancy, give GameTruck Charlotte a call at (704) 900-7798. They can hook you and your best buddies up with the newest consoles and the best games – open-world or not.